Members of the Philippine Airlines Employees Association (PALEA) went back to Malacanang Monday to seek presidential intervention to their 5-year old dispute with the Philippine Airlines on the issue of contractualization. 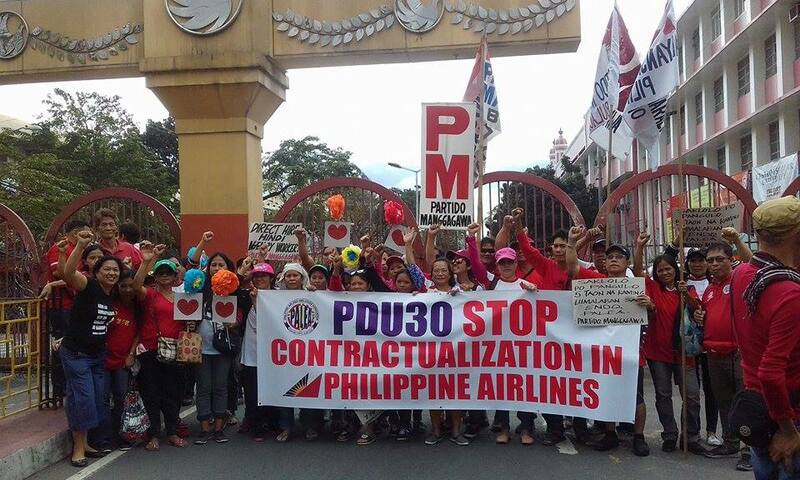 This is the second time PALEA is seeking the intervention of the President on the issue of PAL’s outsourcing program. The first was in 2011 when PALEA asked former President Benigno S. Aquino III to reverse the decision made by his labor secretary Rosalinda Baldoz allowing the implementation of PAL’s outsourcing program that affected some 2,600 workers. Unfortunately, President Aquino took the side of Lucio Tan by denying the petition of PALEA twice. PALEA members stood their ground in opposing the outsourcing program by establishing an extensive protest camp at PAL’s In-Flight Services until a Settlement Agreement was reached with the management in 2013. The Settlement Agreement provided for the compensation for the remaining number of workers and their re-employment to PAL as regular employees. PALEA President Gerry Rivera said PAL has deliberately reneged on their commitment especially on re-employment which is the most important provision of the Settlement Agreement. “Kaya po kami bumabalik sa Tanggapan ng Pangulo ay dahil baka po may tsansa pa na maituwid niya ang baluktot na nagawa ng nagdaang administrasyon at maitawid kami sa tulay ng hustisya na limang taon na naming inaasam,” appealed Rivera. PALEA made this appeal in a march to Malacanang where a dialogue was supposed to happen between the President and labor groups on the issue of endo. The meeting unfortunately was moved to another date later this month. Nevertheless, PALEA members and their supporters decided to push through with their march to voice out their urgent concern to the President. Rivera also hoped that the scheduled dialogue materializes the soonest time possible so that measures on how to effectively end endo is finally threshed out. “Kami po ang naging poster boy ng problemang endo dito sa bansa. Kaya’t kung sakali, baka ang resolusyon sa aming kaso ay maging kaparehong paraan sa ganap na pagtigil sa kontraktwalisasyon na siyang pangako ng Pangulo. Dahil pareho sa aming lahat ang problema – ito ang pagtatalaga ng aming mga buhay at kinabukasan sa mga kontraktor o middleman, ” said Rivera. PALEA is a member of Nagkaisa, a labor coalition that is campaigning for the prohibition of all forms of contractualization and fixed-term employment.